The Curious Wavefunction: Molecules, software and function: Why synthesis is no longer chemistry's outstanding problem. Molecules, software and function: Why synthesis is no longer chemistry's outstanding problem. problem of design and function. Yesterday's post by Derek titled 'The End of Synthesis' (follow up here) ruffled quite a few feathers. But I suspect one of the reasons it did so is because it actually hits too close to home for those who are steeped in the art and science of organic synthesis. The paper which the post talks about, by chemist Martin Burke in Science may or may not be the end of synthesis but it may well be the beginning of the end, at least symbolically. As much as it might be unpalatable to some, the truth is that synthesis is no longer chemistry’s outstanding general problem. Synthesis was the great philosophical question of the twentieth century, not the twenty-first. As Derek pointed out, in the 50s it was actually not clear at all that a molecule like strychnine with its complex shape and stereochemistry could even be made. But now there is little doubt that given enough manpower (read graduate students and postdocs) and money, basically anything that you can sketch on paper can be made. Now I am certainly not claiming that synthesizing a complex natural product with fifty rotatable bonds and twenty chiral centers is even today a trivial task. There is a still a lot of challenge and beauty in the details. I am also not saying that synthesis will cease to be a fruitful source of solutions for humanity’s most pressing problems, such as disease or energy; as a tool the importance of synthesis will remain undiminished. What I am saying is that the general problem of synthesis has now been solved in an intellectual sense (as an aside, this would be consistent with the generally pessimistic outlook regarding total synthesis seen on many blogs, including Derek's.). And since the general problem has been solved it's not too audacious to think that it might lend itself to automation. Once you have a set of formulas for making a molecule, it is not too hard to imagine that machines might be able to bring about specific instantiations of those formulas, even if you will undoubtedly have to work out the glitches along the way. I always think of software when I think about the current state of synthesis. When software was being developed in the 40s and 50s it took the ingenuity of a John von Neumann or a Grace Hopper to figure out how to encode a set of instructions in the form of a protocol that a machine could understand and implement. But what it took von Neumann to do in the 50s, it takes a moderately intelligent coder from India or China to do in 2014. Just as the massive outsourcing of software was a good example of software's ability to be commoditized and automated, so is the outsourcing of large swathes of organic synthesis a telling sign of its future in automation. Unlike software synthesis is not quite there yet, but given the kind of complexity that it can create on demand, it will soon be. To see how we have gotten here it's worth taking a look at the history, and this history contains more than a nugget of comparison between synthesis and computer science. In the 1930s the general problem was unsolved. It was also unsolved in the 50s. Then Robert Burns Woodward came along. Woodward was a wizard who made molecules whose construction had previously defied belief. He had predecessors, of course, but it was Woodward who solved the general problem by proving that one could apply well-known principles of physical organic chemistry, conformational analysis and stereochemical control to essentially synthesize any molecule. He provided the definitive proof of principle. All that was needed after that was enough time, effort and manpower. Woodward was followed by others like Corey, Evans, Stork and now Phil Baran, and all of them demonstrated the facile nature of the general problem. If chemistry were computer science, then Woodward could be said to have created a version of the Turing Machine, a general formula that could allow you to synthesize the structure of any complex molecule, as long as you had enough NIH funding and cheap postdocs to fill in the specific gaps. Every synthetic chemist who came after Woodward has really developed his or her own special versions of Woodward’s recipe. They might have built new models of cars, but their Ferraris, Porches and Bentleys – as elegant and impressive as they are – are a logical extension of Woodward and his predecessor’s invention of the internal combustion engine and the assembly line. And it is this Turing Machine-like nature of synthetic schemes that lend them first to commoditization, and then to automation. The human component is still important and will always be but the proportion of that creative human contribution is definitely changing. A measure of how the general problem of synthesis has been solved is readily apparent to me in my own small biotech company which specializes in cyclic peptides, macrocycles and other complex bioactive molecules. The company has a vibrant internship program for undergraduates in the area. To me the most remarkable thing is to see how quickly the interns can bring themselves up to speed on the synthetic protocols. Within a month or so of starting at the bench they start churning out these compounds with the same expertise and efficiency as chemists with PhDs. The point is, synthesizing a 16-membered ring with five stereocenters has not only become a routine, high-throughput task but it’s something that can be picked up by a beginner in a month. This kind of synthesis might have easily fazed a graduate student in Woodward's group twenty years ago and taken up a good part of his or her PhD project. The bottom line is that we chemists have to now face an uncomfortable fact: there are still a lot of unexpected gems to be found in synthesis, but the general problem is now solved and the incarnation of chemical synthesis as a tool for other disciplines is now essentially complete. So if synthesis is no longer the general problem, what is? George Whitesides has held forth on this question in quite a few insightful articles, and my own field of medicinal chemistry and molecular modeling provides a good example. It may be easy to synthesize a highly complex drug molecule using routine techniques, but it is impossible, even now, to calculate the free energy of binding of an arbitrary simple small molecule with an arbitrary protein. There is simply no general formula, no Turing Machine, that can do this. There are of course specific cases where the problem can be solved, but the general solution seems light years away. And not only is the problem unsolved in practice but it is also unsolved in principle. It's not a question of manpower and resources, it's a question of basic understanding. Sure, we modelers have been saying for over twenty years that we have not been able to calculate entropy or not been able to account for tightly bound water molecules. But these are mostly convenient questions which when enunciated make us feel more emotionally satisfied. There have certainly been some impressive strides in addressing each of these and other problems, but the fact is that when it comes to calculating the free energy of binding, we are still today where we were in 1983. So yes, the calculation of free energies – for any system – is certainly a general problem that chemists should focus on. But here’s the even bigger challenge that I really want to talk about: We chemists have been phenomenal in being able to design structure, but we have done a pretty poor job in designing function. We have of course determined the function of thousands of industrial and biological compounds, but we are still groping in the dark when it comes to designing function. An example from software would be designing an emergency system for a hospital: there the real problem is not writing the code but interfacing the code with the several human, economic and social factors that make the system successful. Here are a few examples from chemistry: Through combinatorial techniques we can now synthesize antibodies that we want to bind to a specific virus or molecule, but the very fact that we have to adopt a combinatorial, brute force approach means that we still can’t start from scratch and design a single antibody with the required function (incidentally this problem subsumes the problem of calculating the free energy of antigen-antibody binding). Or consider solar cells. Solid-state and inorganic chemists have developed an impressive array of methods to synthesize and characterize various materials that could serve as more efficient solar materials. But it’s still very hard to lay out the design principles – in general terms – for a solar material with specified properties. In fact I would say that the ability to rapidly make molecules has even hampered the ability to think through general design principles. Who wants to go to the trouble of designing a specific case when you can simply try out all combinations by brute force? I am not taking anything away from the ingenuity of chemists – nor am I refuting the belief that you do whatever it takes to solve the problem – but I do think that in their zeal to perfect the art of synthesis chemists have neglected the art of de novo design. Yet another example is self-assembly, a phenomenon which operates in everything from detergent action to the origin of life. Today we can study the self-assembly of diverse organic and inorganic materials under a variety of conditions, but we still haven’t figured out the rules – either computational or experimental – that would allow us to specific the forces between multiple interacting partners so that these partners assembly in the desired geometry when brought together in a test tube. Ideally what we want is the ability to come up with a list of parts and the precise relationships between them that would allow us to predict the end product in terms of function. This would be akin to what an architect does when he puts together a list of parts that allows him to not only predict the structure of a building but also the interplay of air and sunlight in it. I don’t know what we can do to solve this general problem of design but there are certainly a few promising avenues. A better understanding of theory is certainly one of them. The fact is that when it comes to estimating intermolecular interactions, the theories of statistical thermodynamics and quantum mechanics do provide – in principle – a complete framework. Unfortunately these theories are usually too computationally expensive to apply to the vast majority of situations, but we can still make progress if we understand what approximations work for what kind of systems. Psychologically I do think that there has to be a general push away from synthesis and toward understanding function in a broad sense. Synthesis still rules chemical science and for good reason; it's what makes chemistry unique among the sciences. But that also often makes synthetic chemists immune to the (well deserved) charms of conformation, supramolecular interactions and biology. It’s only when synthetic chemists seamlessly integrate themselves into the end stages of their day job that they will learn better to appreciate synthesis as an opportunity to distill general design principles. Part of this solution will also be cultural: organic synthesis has long enjoyed a cultish status which still endures. However the anguish should not obscure the opportunity here. The solution of the general problem of synthesis and its possible automation should not leave chemists chagrined since it's really a tribute to the amazing success that organic synthesis has engendered in the last thirty years. Instead of reinventing ourselves as synthetic chemists let's retool. Let the synthetic chemist interact with the physical biochemist, the structural engineer, the photonics expert; let him or her see synthesis through the requirement of function rather than structure. The synthesis is there, the other features are not. Whitesides was right when he said that chemists need to broaden out, but another way to interpret his statement would be to ask other scientists to channel their thoughts into synthesis in a feedback process. As chemists we have nailed structure, but nailing design will bring us untold dividends and will enormously enhance the contribution of chemistry to our world. "They might have built new models of cars, but their Ferraris, Porches and Bentleys"
Exactly. And that's why the future of transportation is not in gasoline-fueled cars. I think the reference to John von Neumann is apt, but looking back even further you might consider the insights of Ada Lovelace. She envisioned the idea of a computer long before the technical capabilities existed. She also felt, so far correctly, that a computer could never duplicate the function of a human brain. Some later scientists thought otherwise, and even talked to the press at the time about their "mechanical brains." Despite all the advances in computer science, it never happened. So no, this article really did not "hit home" with most of us chemists. We welcomed it. The offense was the over-hyped implication, mostly by the author of this article talking to the popular press and trying to promote his company, that this somehow would pave the way 3D molecule printers and home-synthesis kits. Maybe, a hundred years from now. Maybe sooner. Or maybe never. And just one more counterpoint: There are 20 natural amino acids and five nucleic acids. The chemistry exists to automate the synthesis of any combination of these. Yet, even limiting oneself to compounds with molecular weights of under 1000, the chemical space accessible from all possible combinations of these is a fraction of the theoretical space once you move away from peptides and nucleotides. Automation of the specific transformation described in this article is a magnificent advance, yet it still represents a tiny fraction of the bond-forming reactions that are needed by chemists. So the answer to your question "What next?" will likely be another bond forming reaction, and then another. The hammer will be replaced by a nail gun, and hand-drafted plans will be replaced by CAD. That does not mean we are on the verge of robotic construction of a house, and a builder who points this out does not do so because he feels threatened. 1) Macrocylization might have fazed Woodward's group, but since he died in 1979 that would have been 36 years ago, not 20. A lot has happened since then, such as the development of general strategies for macrocyclization that you mentioned. Some of these date back nearly to Woodward's time and are nearly as well established now as the Aldol or Grignard reaction was in Woodward's time. 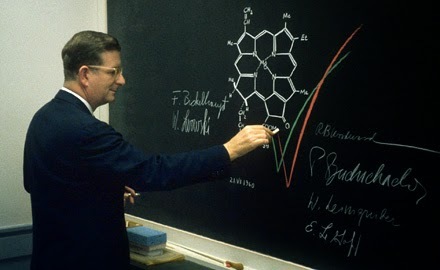 2) While Woodward was the first great practitioner of total synthesis, he hardly can be said to have created "a general formula that could allow you to synthesize the structure of any complex molecule". If that honor belongs to anyone, it belongs to EJ Corey, who popularized "Retrosynthetic Analysis". Even there, it is not a general formula that can be plugged into any situation. It is an analytical approach for devising a strategy for synthesizing complex molecules and deciding which of many possible strategies has the best chance of success. It also was the mother that gave birth to countless inventions (such as macrocyclization) when retrosynthetic analysis led to a transformation that was unknown or difficult. As a side note, Corey and others have tried for years to automate the process of retrosynthetic analysis. To my knowledge, it has never been particularly successful. It is still too complex and to subjective. 3) The statement "Every synthetic chemist who came after Woodward has really developed his or her own special versions of Woodward’s recipe" is just plain wrong. Woodward did not provide a recipe, and I am sure he would bristle at the suggestion. He was a master at solving complex puzzles by breaking them down into their component parts and seeing those parts clearly when no one else could. That was not necessarily something new, but he did it far better than anyone before him. Then, he stitched those parts together in a masterful way that seemed almost miraculous at the time. That's not something that can be reduced to a formula nor can it be generalized (like the Turing Machine) to be applied to any subsequent synthesis. Instead, more than anyone before him Woodward demonstrated that syntheses once considered impossible actually were possible. That is his legacy. There was no special formula other than being exceptionally creative and really, really smart. His dwindling number of academic descendants have tried to emulate his success, and certainly many feel that they are the true keepers of his legacy, even if the message about what is possible is now clear and very old news. Most synthetic chemists don't practice chemistry anything like what Woodward did, but they still treat him with almost religious reverence. So while the question of what is possible has been answered and should be put to rest, I think your statement that the general problem of synthesis is solved is more than just wrong. The question itself has no meaning. There is no general problem of synthesis, at least not one that can be articulated. There is no general answer to the question "How do I make a molecule?" or even "How do I make or break a bond?" Rather, there is a large and growing list of tools that can accomplish transformations that were impossible in Woodward's time. There is no general formula or strategy for how these tools should be applied to synthesize any molecule or even a large subset of molecules. Some of these tools are sufficiently defined in both procedure and scope that they can be considered general for a specific purpose. The macrocyclizations that your interns use is a great example, and I am not surprised that a talented intern can do just as well as a PhD at applying them. I suspect that your interns would (understandably) have much more trouble than the PhD knowing when this procedure is the right tool and, more importantly, what tool to use in its place when it is not. As far as I can see, there is no general answer to that question, at least not yet. Thanks for your detailed and thoughtful comment. I plan to partially respond to it in a separate post. Stay tuned!